Periodontal disease, also known as gum disease, is a bacterial infection that is caused by plaque and is one of the most prevalent and destructive dental problems people face. This is a condition that should be treated immediately as if it is left untreated, it can lead to tooth and bone loss. According to the Centers of Disease Control and Prevention (CDC), nearly half of Americans ages 30 and over have gum disease. Unfortunately, this dental condition often goes unnoticed, which is why it is important to visit your Glen Mills dentist twice a year. In between exams, however, there are a few warning signs you can keep an eye out for that indicate periodontal disease. Continue reading, as we share six common signs of gum disease that should have you making an appointment at your local dentist office! Like all infections, gum disease triggers a response in the immune system to release antibodies to attack the infectious bacteria. When this happens in the gums, it is common for inflammation, or swelling to occur. Do your gums bleed when you brush or floss? It is not normal for healthy gum tissue to bleed. While in some cases, bleeding may be caused due to over-aggressive brushing and flossing, bleeding gums are a sign that your gum tissue has weakened so much so they bleed very easily. Do your teeth hurt when you drink something cold or warm or when you bite down? Tooth sensitivity is a common symptom of periodontal disease, as the infection can cause the gums to draw back (receded gums) from the teeth. Gum recession leads to exposed tooth roots, which are more sensitive to changes of temperature and pressure in the mouth. Gum disease can cause the loss of the gum and bone attachment, causing affected teeth to feel loose or even shift to a different position. As the disease worsens, so does the effects on the gums and bone surrounding each tooth. Unfortunately, this is a later sign of gum disease, and without seeking immediate dental care, you’re at risk of losing the tooth. When gum tissue weakens and detaches from the tooth, the normally thin gap between the gum and the tooth becomes deeper and forms a void that is referred to as a periodontal pocket. This generally leads to an abscess where pus collects in the pocket which results in more inflammation and redness in the surrounding gum tissue. Foul-smelling breath is commonly a result of foods that were eaten, or maybe going to bed without brushing our teeth. Additionally, bad breath can be caused by smoking or using oral tobacco products. However, bad breath is also a sign of gum disease. As mentioned, gum disease is the overgrowth of bacteria on the teeth and underneath the gums, and believe us when we say, bacteria does not smell good. As the condition worsens, more bacteria will gather, causing foul-smelling breath. Gum disease is easily prevented by brushing your teeth properly each day, flossing, and using an antiseptic rinse or mouthwash. Flossing should take place after each meal to dislodge any food that may be stuck near your teeth or gums. Brushing for a minimum of two minutes will help with plaque removal. Lastly, mouthwash will kill harmful bacteria and keep your gums healthy. Aside from daily care you can do yourself, it is important to visit your dentist every six months for an exam and professional teeth cleaning to keep your oral health in optimal condition. 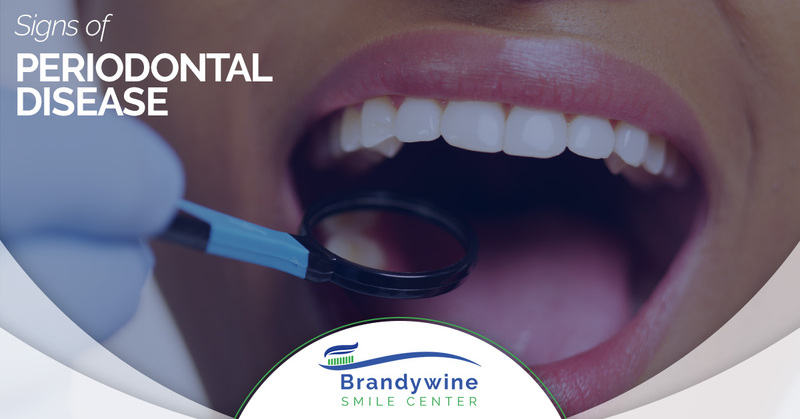 If you encounter any of the signs discussed above, make an appointment at Brandywine Smile Center! The sooner our dentists can diagnose gum disease and begin treatment, the less damage it will cause – increasing your chances of restoring healthy gums and teeth. To schedule a dental examination, contact our office today!